Peace and quiet have not yet returned to the east German city of Chemnitz, which was the stage of mass anti-immigration protests last week following the stabbing of a German man by two refugees. It now appears that during those initial Sunday and Monday protests, when there were reports of ‘refugee-hunts’ by far-right groups, a Jewish restaurant named ‘Schalom’ was also attacked by a masked gang. A spokesman for the regional interior ministry in Sachsen admitted that "a politically-motivated act with an anti-semitic background was the most plausible" explanation for the attack on the Jewish restaurant in Chemnitz. The police report states that a masked gang wearing black clothes of around a dozen people attacked the restaurant hurling rocks, bottles and a metal pipe at the place on Monday evening August 27 (according to the reports published in Die Welt and the Freie Presse newspaper). Restaurant owner Mr Uwe Dziuballa was hurt during the attack, suffering an injury to the shoulder. The Jewish restaurant, opened in 2000, has been the victim of attacks several times in the past. Related coverage: <a href="https://thegoldwater.com/news/36350-Germany-New-Merkel-Seehofer-Clash-Immigration-Is-The-Mother-Of-All-Problems"> Germany - New Merkel-Seehofer Clash “Immigration Is The Mother Of All Problems”</a>. Meanwhile, the German press continues to warn the government of the dangers of not dealing with the immigration issue in certain states, certainly in Saxony where the city of Chemnitz is located. 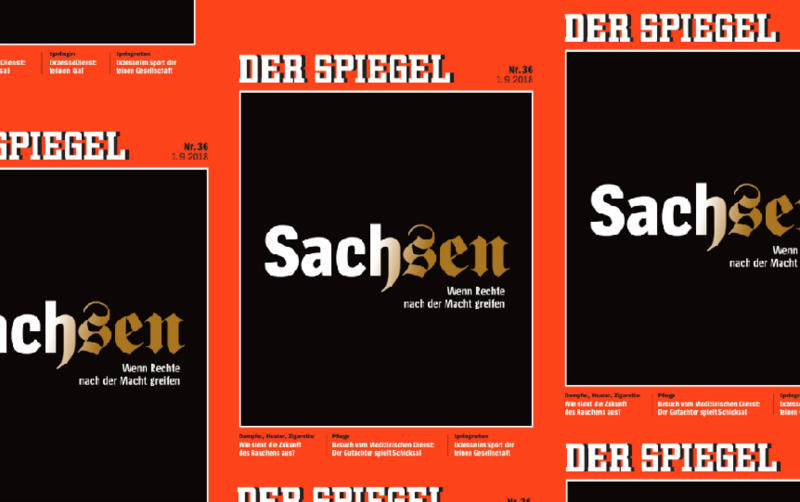 Magazine Der Spiegel, pictured, wrote the Saxony (Sachsen in German) province name in the infamous WWII style on its front page this week. There are regional elections in Germany in October and the right-wing AfD is rising in the polls, currently on par with the co-ruling Socialist Democrats at around 18% of votes, their highest vote share ever. The wave of Muslim immigration since 2015 coupled with Islamic terrorist attacks on German soil has made many Teutons give up their dreams of multiculturalism and choose to return to nationalism instead. The only one that hasn’t understood this just yet seems to be Ms Merkel herself. Self inflicted persecution strikes again.